Try this delicious strawberry & rhubarb jam tarts recipe for a sweet and tasty dessert anytime. Made with Jus-Rol shortcrust pastry sheets. Easy to use ready rolled Jus-Rol Shortcrust Pastry Sheets are great for topping, wrapping or filling with your favourite ingredients. Unroll the pastry and use an 8-10cm fluted cutter to cut out 12 circles – re-roll the trimmings if you need to. Press into the holes of a fairy cake tin, then chill in the fridge. Put the rhubarb and jam in a pan, cover and cook over a very low heat, stirring occasionally until the rhubarb has begun to soften and let out water. Take off the lid and cook on a higher heat, stirring constantly, until the rhubarb has softened and the mix is back to a jammy consistency. Preheat the oven to 190°C (170°C fan oven) Gas Mark 5. Spoon a little jam into each tart, then bake for 20 minutes until golden brown. 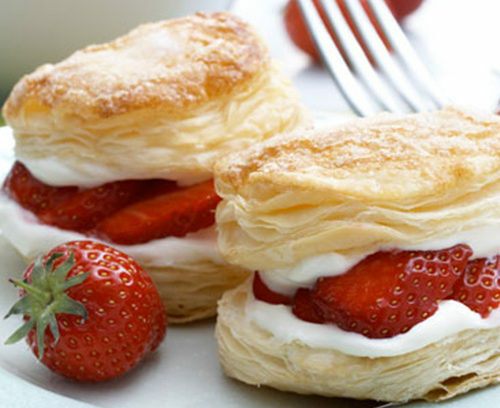 Leave to cool completely before enjoying with a little clotted cream on top, if you like.